ski+snowshoe = skishoe | combining the efficiency and fun of skis with the ease and mobility of snowshoes. I first heard of Hok skis several years ago from North Country Trail Association (NCTA) volunteers Jim & Jeri Rakness. They kept insisting that I really needed to try them out. At first, I couldn’t imagine what it was they were describing and, to be honest, I was a little skeptical. This is because I was quite happy snowshoeing, a favorite winter activity of mine. I’m lucky enough to snowshoe both for family fun and for my work for the NCTA. 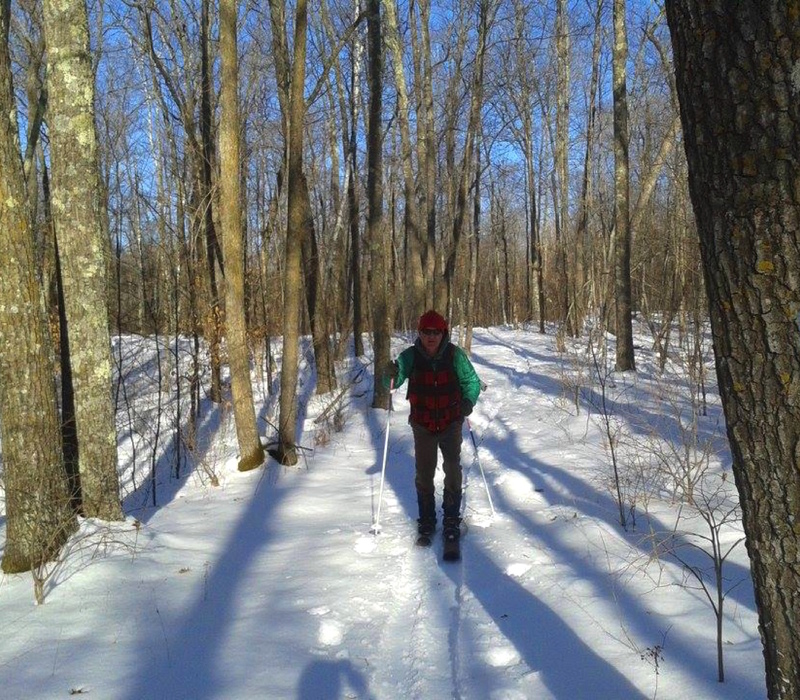 We usually scout and flag new sections of the North Country National Scenic Trail during the winter because we can actually see in the leafless woods and go more places when the ground is frozen. The last several winters here in northern Minnesota; however, have not delivered adequate snowfall for snowshoeing. So, last winter when I was invited to go out with some local NCTA volunteers on a backcountry ski outing I decided to finally try it. We went across a frozen lake and some connected wetlands/beaver ponds because there was only about 2” of snowcover on the ground. 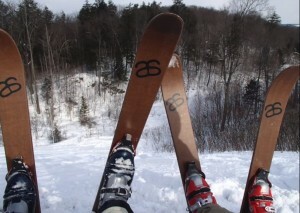 It was fantastic and love at first try with the Hok skis. This past fall, I purchased a pair of Hoks and anxiously waited for the first snowfall. I first tried them out at a January 2nd backcountry exploration hike in Itasca State Park (source of the Mississippi River’s headwaters). The conditions were perfect for the Hoks. Several other hikers asked to try out the Hok skis during the event. All enjoyed them and one person bought a pair that night. 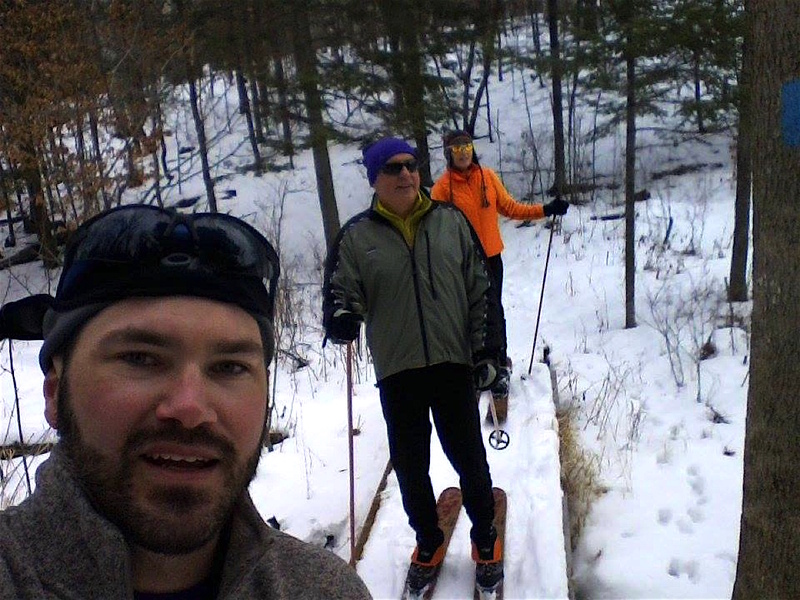 I also thought that backcountry XC skiing with the Hok skis would be a great addition to our Winter Trails Day events where we typically introduce people to snowshoeing. Last winter, I had only one attendee at a free Learn to Snowshoe Clinic because there just wasn’t enough snow for people to get excited about trying it. While this winter has delivered more snow than last year, it’s still not deep enough for me to need snowshoes – which are pure work to walk with when they’re not needed for flotation. I was hoping that the inclusion of the backcountry XC skiing component and having pairs of Hoks on hand for people to try out would attract more interest. That turned out to be the case. On January 30th, we hosted a Winter Trails Day event at the MSUM Regional Science Center just east of Fargo, ND. While the crowd was small (there was a big winter festival going on in town), everyone there was excited to try out the Hok skis. 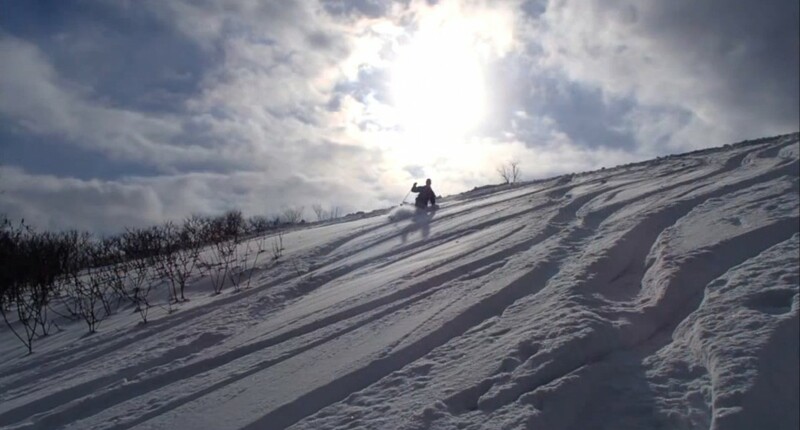 We found a little patch of wind drifted snow in the prairie and people skied around and enjoyed themselves. Several participants commented that they were going to look at buying a pair. We hosted a Winter Trails Day event on February 6th at Detroit Mountain Recreation Area in Detroit Lakes, MN that drew a good crowd. 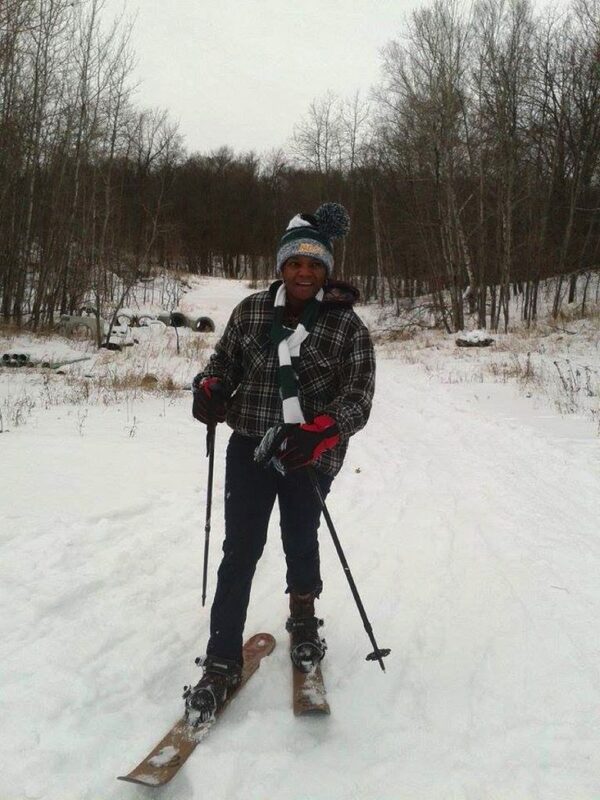 While most admitted they were there to try snowshoeing, several did venture out on the Hok skis and had an enjoyable experience. A few inquired about where they could buy a pair. Later that afternoon, we had a new participant show up for our guided hike/ski on the North Country Trail and she really enjoyed it. After these experiences I’m convinced that if people interested in winter sports will try a pair of Hok skis they’ll love it. Many will want to purchase a pair. I can envision a time – maybe five or ten years from now –when local outdoors stores in northern Minnesota will carry Hok skis. 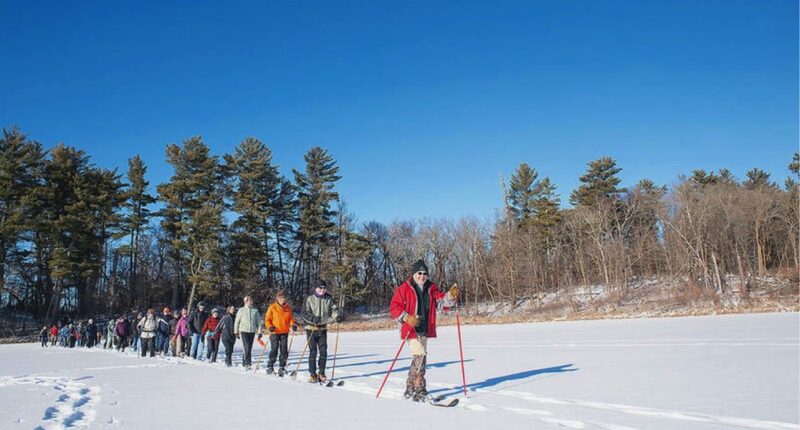 At this same time, our guided winter events on the NCT will feature equal numbers of snowshoers and Hok skiers. Because lately we haven’t received good enough snow for snowshoeing or XC skiing. While these are the more traditional winter silent sports activities here in MN & ND, they do require more snow than Hoks. Because they are more efficient in covering ground than snowshoes and winter hiking. You have the ability to glide on each step and also to ski down the hills. Because you can go just about anywhere with them on – across a frozen lake, up a frozen river, down a trail, etc. Because they are so well made and durable. Because they’re tons of fun! The National Park Service’s Yellowstone Cougar Project embraced the Hok skis for their winter field work studying Yellowstone’s most elusive large carnivore. 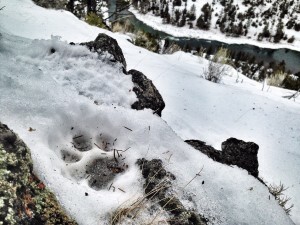 Biologists have been conducting intensive snow-tracking surveys in Yellowstone’s rugged winter terrain to detect cougar tracks and follow them through common travel routes to bed sites, scent marking sites, and prey remains.